Shutterworks Rentals Spokane is proud to offer a spacious rental studio for the video and photography needs of Spokane. The studio is a free-standing wood-built structure with fiber glass insulation. Our rental studio is located on the ground floor with a several entrances and a private bathroom. We contracted an acoustic consultant to optimize sound propagation and permeation within the space. Floor-to-ceiling sound curtains line walls and ceiling to minimize flutter and reverb. Further treatment was accomplished with strategically placed acoustic foam panels. 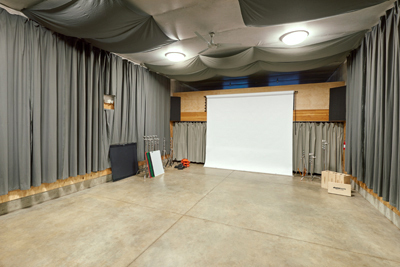 An enormous 12 x 18 foot roll up door opens to reveals the entire studio. You can pull right up to the door to load in. Our large drive-through lot easily accompanies commercial vehicles and other large vehicles. Parking is free for all vehicles on our private secured lot. The studio has a smooth concrete floor with a drain. At the heart of the studio rests 400 amps of electric service. Two 220v outlets plus an additional twelve 120v outlets line the walls of the studio. Four of those 120v outlets are on a dedicated 20 amp circuit. 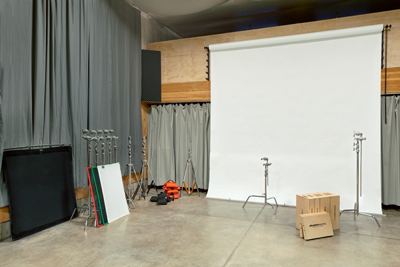 The studio comes stocked with light stands, C-stands, apple boxes, sand bags, flags, nets, scrims and more. 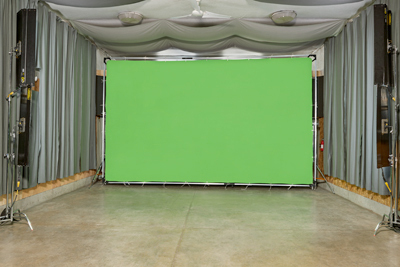 Additional options include green screen chroma-key and still photography studio strobes by Profoto. 1 - Step Ladder 2 ft.
1 - Ladder 4 ft.